Nashville, Tenn. (August 20, 2012) – Nashville Predators President of Hockey Operations/General Manager David Poile announced today that the club has signed forward Mike Fisher to a two-year, $8.4 million contract that will pay him $4.2 million in both 2013-14 and 2014-15. Fisher, 32 (6/5/80), ranked second on the Predators in goals (24) and third in points (51) in 2011-12, in addition to ranking 11th in the NHL in game-winning goals (7). His offensive numbers – coupled with his solid defensive play (he posted a +11 and tied for eighth among NHL forwards in blocked shots with 76) – earned him the seventh-most votes for the Selke Trophy. The Peterborough, Ont., native also became the franchise’s second-ever award winner as the recipient of the 2012 NHL Foundation Award, which recognizes a player who applies the core values of hockey – commitment, perseverance and teamwork – to enrich the lives of people in his community. In 774 career regular-season NHL games with Ottawa and Nashville since 1999, Fisher has amassed 411 points (196g-215a). In 97 playoff contests, he has 39 points (18g-21a) and advanced to the 2007 Stanley Cup Finals. Ottawa’s second selection, 44th overall (second round), in the 1998 Entry Draft was acquired by the Predators on Feb. 10, 2011 and proceeded to pace the club in points (3g-3a-6pts) during the franchise’s first-ever series victory over Anaheim in the 2011 Western Conference Quarterfinals. He has twice represented Canada at the World Championships (2005 and 2009), earning a silver medal on both occasions. The Nashville Predators made a move to add another experienced defenseman to their roster this morning with the announcement of the signing of Scott Hannan. Nashville, Tenn. (August 17, 2012) – Nashville Predators President of Hockey Operations/General Manager David Poile announced today that the club has signed defenseman Scott Hannan to a one-year, $1 million contract. Hannan, 33 (1/23/79), has amassed 197 points (33g-164a) and 522 penalty minutes in 908 regular-season games and 15 points (1g-14a) and 89 penalty minutes in 82 playoff games with San Jose, Colorado, Washington and Calgary since the 1998-99 season. The 6-1, 225-pound blueliner enters the 2012-13 season having played more games than any NHL defenseman in the last 10 seasons (798). Hannan dressed for 75-or-more games for the 11th consecutive season (78), and averaged more than 20 minutes of ice time for the ninth time in the last 10 seasons (20:21) with the Calgary Flames a season ago. The Richmond, B.C., native was drafted 23rd overall (first round) by San Jose in the 1997 Entry Draft, and was part of the gold medal-winning Canadian squad at the 2004 World Cup of Hockey. He joins captain Shea Weber as Kelowna Rocket alums in the Predators organization, having posted 139 points (46g-91a) and 339 penalty minutes in 235 games with the club from 1995-99. With the Hannan signing, the Predators now have two defensemen with more than 800 games of NHL experience for the first time in franchise history (Hannan, 908gp; Hal Gill, 1,070gp). Both veterans – in addition to top-four blueliner Kevin Klein – also perennially rank among the League leaders in average penalty kill time on ice and blocked shots. That trio joins the two-time Norris Trophy runner-up Weber and talented, offensively gifted under-23 NHLers Roman Josi and Ryan Ellis, giving the Predators both three left shooting and three right shooting defensemen among their balanced top-six corps. ·Event highlighted by player autographs, open skate, select a seat/open house, Pro Shop deals, an auction item fire sale, Smashville Rewards demo, Smash Hit Karaoke and Town Hall meeting. WHEN: Monday, August 20, 4-8 p.m.
NOTES: Players scheduled to appear include Jon Blum, Mike Fisher, Paul Gaustad, Hal Gill, Kevin Klein, Chris Mason, Brian McGrattan, Craig Smith and Colin Wilson. Attendees to Monday’s event will receive a special discount of 25 percent on tickets to Petey’s Preds Party on September 17. 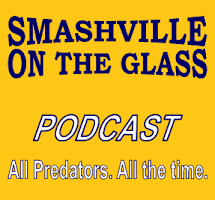 The Predators flagship radio station 102.5 The Game will broadcast live from the Skate of the Union Town Hall Meeting. The Nashville Predators kick off what will be a month long celebration of all things Preds hockey today with an open house at Bridgestone Arena today. Later this month there will be a town hall forum with players and coaches at the annueal Skate of the union address. ·Arrive to be Entered to Win a Pair of 2012-13 Season Tickets – 10-11 a.m.
·Box Office Opens/Tickets on Sale – 10 a.m.
·Stick-n-Puck Session – 10 a.m.-1:30 p.m.
Stick-n-Puck session is good for players of all ages (youth and adult) to get on the ice and work on different puck handling and shooting skills. Instruction will not be provided. Full ice hockey equipment required; participants must supply their own equipment Skate and shoot at your own risk. ·Preds Foundation Auction Item Fire Sale – 2-4 p.m.
·Tax Free Weekend – Saturday, Aug. 4 at 10 a.m. through Sunday, Aug. 5 at 5 p.m.